Stardust's Sampe Return Capsule streaks across the predawn skies as it reenters the Earth's atmosphere. 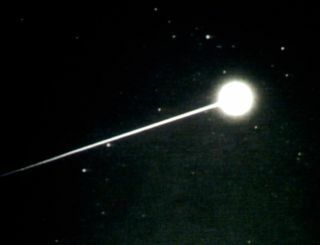 This image was taken by observers from NASA's DC-8 Airborne Laboratory with a mission to explore the conditions during reentry from the light emitted by the fireball caused when the capsule streaked through the sky. DENVER, Colo. -- NASA's Stardust sample return capsule has returned to Earth today, completing a 2.88 billion mile journey that took almost seven years. The capsule successfuly floated to the ground in the Utah Test and Training Range (UTTR)under billowing parachute where a helicopter team successfully located it despite dark desert conditions. The capsule is reportedly intact from the helicopter observations. The capsule's unofficial touch down time was 5:10 a.m. EST. Onboard the small container, a treasure trove of interstellar and comet particles--the collective wisdom of the spacecraft's nearly seven year voyage through space. Tucked within the spacecraft's sample container are pieces of Comet Wild2 (pronounced "Vilt 2") and interstellar dust--trapped in a material dubbed aerogel--for scientists to analyze. These are first samples of material from our solar system returned to Earth from beyond the moon. There was palpable heavy-breathing here at the Lockheed Martin Mission Support Area, waiting for a drogue parachute to be released from the falling capsule, thus stabilizing the craft for deployment of its main parachute. Lockheed Martin Space Systems, Denver, developed and operated the Stardust spacecraft. In September 2004, the Genesis spacecraft--also built by Lockheed Martin for NASA--smashed into Utah due to improper placement of recovery system components. "Everything worked so well. What an exciting moment," said Allan Cheuvront, Stardust spacecraft engineer here at Lockheed Martin Space Systems. After descending into the Utah Test & Training Range, the capsule activated its locator beacon. Helicopters were quickly dispatched to a large expanse of desert, attempting to locate the capsule and initiate ground recovery operations. Reports have started to come in of skywatchers sighting the speeding capsule as it shot across the sky over the western United States. "We saw it in the sky...it was great," said Paula Nicholson, Public Affairs Officer at the U.S. Army Dugway Proving Ground in an email to SPACE.com. Throughout the late Saturday night into early Sunday morning, cheers broke out here as various milestones were met in deploying the sample return capsule from the Stardust mother craft. The main spacecraft--once it had ejected the sample return capsule--nudged itself into a "divert maneuver". That maneuver assured that the mother vehicle would not hit Earth. It is now on an orbit around the Sun. "We achieved what we wanted to do...the burn went right on time," said Cheuvront shortly after the mother ship was placed on its new trajectory.